Our military veterans make sacrifices every day to protect our independence. Many of these brave men and women come home bearing invisible wounds such as Post-Traumatic Stress Disorder and Traumatic Brain Injuries. PAWS BE GOOD carefully selects unwanted and forgotten dogs from local shelters and trains them to be service dogs for these soldiers, at no cost to the soldier. Temporary foster homes and tax deductible donations are needed to care for these dogs while in transition between shelter and soldier. This is your opportunity to support their independence as they have defended ours. 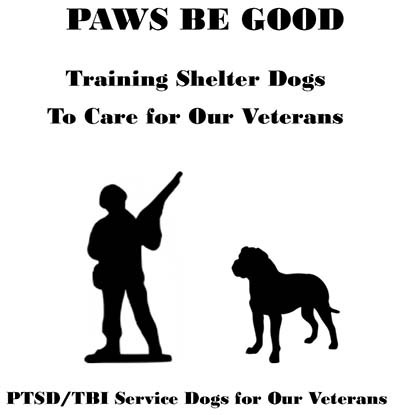 Please contact PAWS BE GOOD today (706-669-7670) to learn how you can help those who have given us so much….Our Military Veterans. PAWS BE GOOD is a Georgia, non-profit, tax exempt, 501C3, company.